As Yakov Smirnoff would often say, “I love this country.” The Ukrainian-born comedian built a sizeable career on this line and his signature Russian reversals. In America, you always find a party. In Russia, Party always find you. For Smirnoff, these jokes were only partly tongue in cheek. They reflected an abiding appreciation for the economic and personal freedoms of his newly adopted country. On July 4, 1986, Smirnoff took the Oath of Allegiance on Ellis Island with a scale-size model of the Statue of Liberty in his hand. 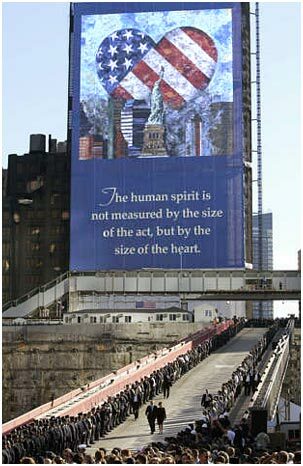 After the 9-11 attacks he used $100,000 of his own money to mount a patriotic mural near Ground Zero. You are living in Nazi-occupied Holland of 1942. A family of Jews is hiding in your attic. The authorities knock on the front door and ask an entirely unambiguous question: “Do you have any Jews in your house?” You have a choice: tell the truth, or tell a lie. Which will it be? Life is messy, like making sausages. When you think about it, a lot of food is like this. Pretty much everything from milk to steak to lettuce to mushrooms goes through at least one not-so-pretty stage as it passes from farm to fridge. Most of us city folks are happy with the hosed-down, shrink-wrapped groceries to be found in the aisles of the nearest megamart. Even there, however, we dare not poke our noses behind the mysterious swinging doors. After several summers in a grocery warehouse, and cleaning up a bakery every night after school, I can personally attest to the principle that ignorance is bliss when it comes to store-bought food. What about making eternal life possible for the rest of us? In one sense, the task of redemption was a very orderly business. God made a plan and stuck to it. But a lot of the people we encounter along the way are messy. There was nothing neat and tidy about David’s life. We can say the same thing about the lives of Solomon, Abraham, Isaac, Jacob, Rahab… well, you get the picture. A left-ward shift in American politics is triggering an intense reaction among libertarians and laissez faire capitalists. One sign of the growing foment is a renewed interest in Ayn Rand’s Atlas Shrugged (1957). In late February, the Ayn Rand Center for Individual Rights was reporting record sales. Protestors were holding up signs proclaiming “Atlas Will Shrug.” Business owners and others were threatening to “go Galt” – a reference to the novel’s enigmatic John Galt. Like the Ayn Rand character, people are starting to dial back their production to teach the government a lesson about the value of entrepreneurship and innovation.